Well another week has passed, and I am still enjoying rediscovering my wardrobe. And interestingly I am not feeling like I need to go shopping as it has become very clear that I have a lot of clothes!!! For anyone new to my blog: I am doing #dressupjune embracing my vintage fashion daily, and generally dressing up and making an effort! So here is what I wore last week. 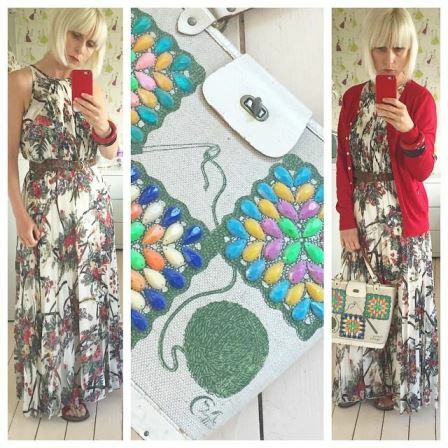 I started the week in a modern maxi dress bought from Outfit last year and added a vintage plaited leather belt rather than the matching tie belt that it came with. It was from one of the concession in there called Izabel. I used my vintage 1960s Enid Collins tote bag with Granny Squares on the front. This one is quite a rare one and I so love it! I bought it from ebay. It was National Pink Day on Tuesday which I had NO idea about when I got dressed! 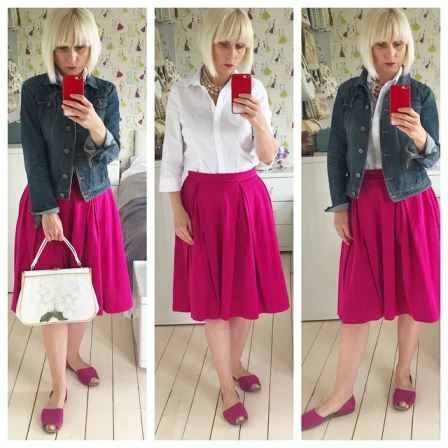 I embraced my inner Molly Ringwald and wore my bright pink skirt from TopShop (3 years old) and pink shoes from this seasons F+F. I teamed it up with a fitted white blouse from Matalan, and my trustee denim jacket from Next. The necklace is a three tiered vintage one made from pale pink glass and my handbag is 1960s. 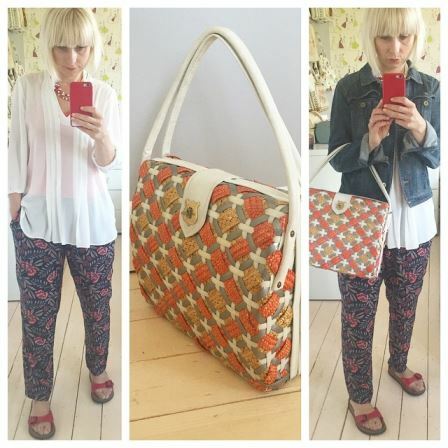 I love this bag – it has a plastic front with flowers inside. I bought it from ebay. Wednesday was cooler so I wore my silk Monsoon trousers and a 1980s vintage blouse bought from a Judy’s Vintage Fair some time ago. 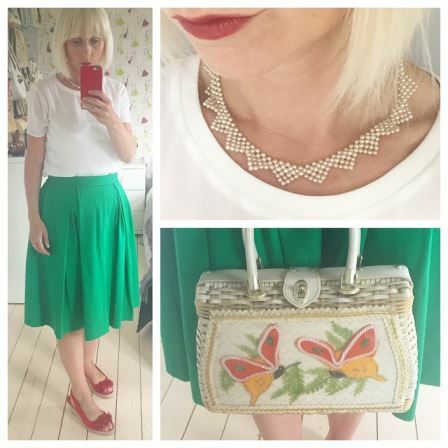 I teamed it up with a vintage four tiered pearl necklace bought from a car boot sale and my wonderful 1950s bag bought for me by my husband years ago for Christmas. It is massive so I don’t use it much. Lastly I’m wearing my red patent Birkenstocks. 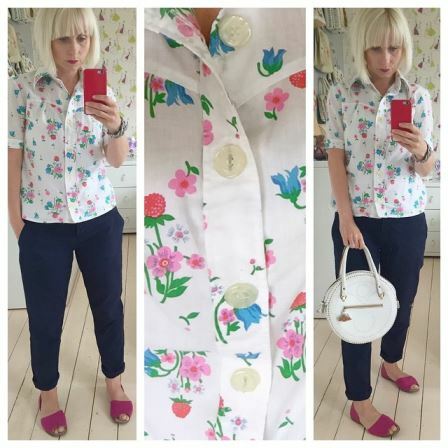 Thursday my Next chinos were worn once again – they are quickly becoming my most worn item in my wardrobe right now! They are from this seasons range. I also wore my 1970s flower power blouse bought from the Vintage Village at The Clothes Show, a silver tone plaited cuff bought from an antiques fair and given to me for Mother’s Day and my 1950s leather bag bought from a charity shop. Friday’s look is a simple one. I wore my green Topshop skirt (same as the pink one!) and a simple white T from Matalan. 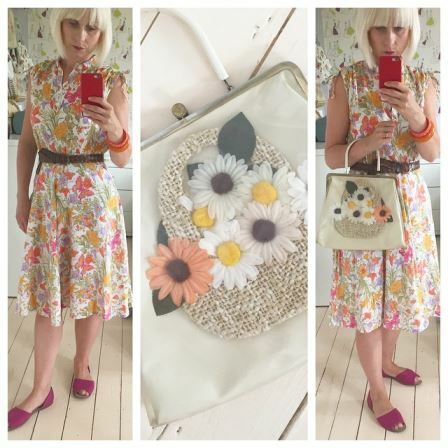 The bag is a Princess Charming Atlas window pane bag from the 1950s and the necklace is also 1950s – it reminds me of bunting! The wedges are from Clarks, bought about 4 years ago but they have similar ones this season. As it was the weekend, we had a great family day on Saturday, going to the cinema and out to eat to celebrate another good term at school. I am wearing a vintage 1970s dress worn with my plaited leather belt, my handbag is from the 1960s and was bought from ebay. I haven’t used this for years so it was great to get it admired again! I am also wearing a 1930s celluloid bangle bought from Etsy. I spent Sunday in the garden, weeding! 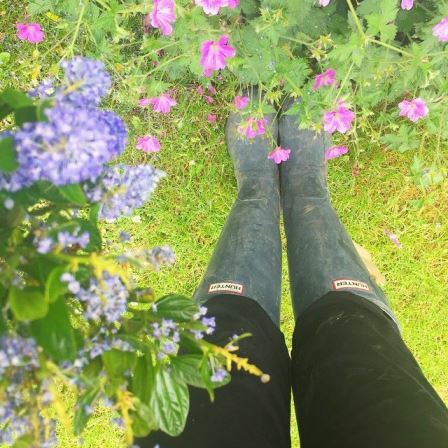 I wasn’t dressed up nor vintage but I was wearing my very muddy Hunter wellies. So are you doing #dressupjune? Which outfit was your favourite?